" Snap to create your own unique electronic models." The winner of numerous awards in the field of STEAM education, Little Bits gives us fun and easy to use electronic bits that make snap together to make a complete circuit every time. 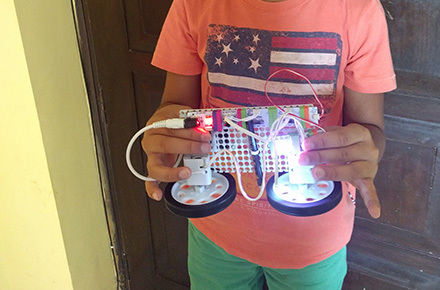 Creations using Little Bits can be as simple as alarm clocks to digital instruments and even wireless robots! Children can build several different projects using these bits, which turns them into designers, inventors, problem solvers and creators all at the same time!. Student will learn circuit designing, in which student will do hands on electronics.